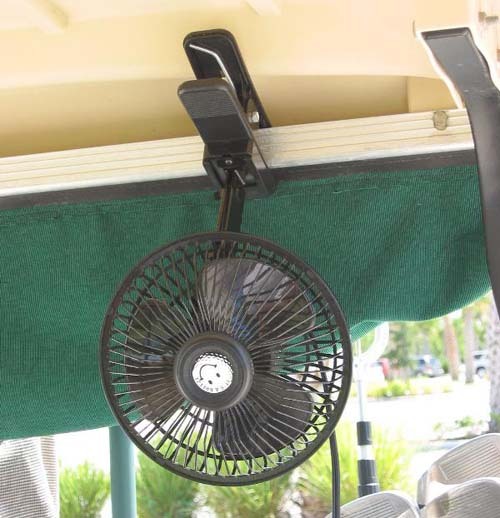 Keep the cool breezes flowing in your golf cart! 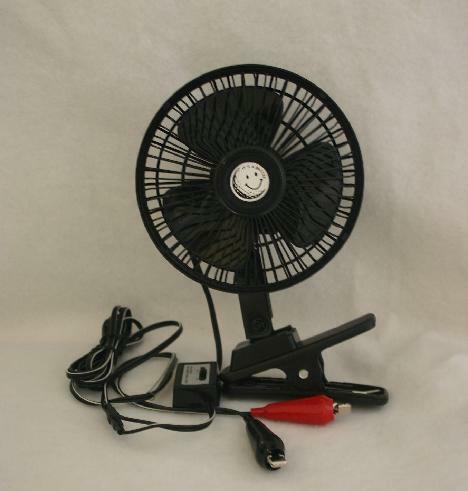 This 6", 12-volt oscillating fan is portable and can be attached to the back of the golf cart, the dashboard, the top of the windshield or any other sturdy place. --Universal fan for electric and gas golf carts, Club Car, E-Z-GO, Yamaha. --Comes with easy schematic installation instructions. There are separate instructions for a 36 and a 48 volt golf cart. --Draws a meager .59 amps from a 12-volt battery. --An optional carrying case is available for easy transportation to your golf course. --Cord is 10' in length. 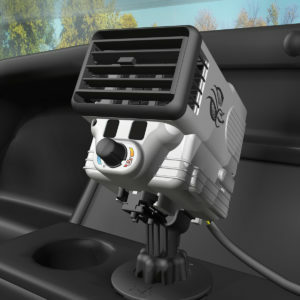 Golf cart heater and fan combination makes you more comfortabale in both the summer and winter. --A powerful fan with two air flow modules. You can set the direction toward the driver. --Produces 100 degree heat to warm the air. --Works on all 48 volt golf carts (not on 36 volt). --An electronic eye turns the unit on and off when you enter or leave the cart. --Easy to install. 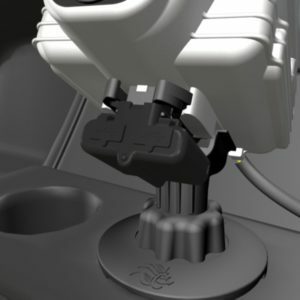 It is mounted to the cup holder and is connected to the batteries with a collapsable wire harness. --The product is also know as the Climate Caddy. --Here is a video of the installation process. --Vent system allows you to point the air where you want it. --Uses a whisper silent fan. --A battery sensor shuts off the unit if the battery charge drops below a set threshold. --After a 45 second hot blast, the unit automatically goes into a saver mode. --Made of high impact UV-resistant plastic with weatherproofing protection. --Dimensions are 4.2" x 10.9" x 11.7". A dual USB power accessory may be added. It snaps on the same mounting base and plugs into the same harness. 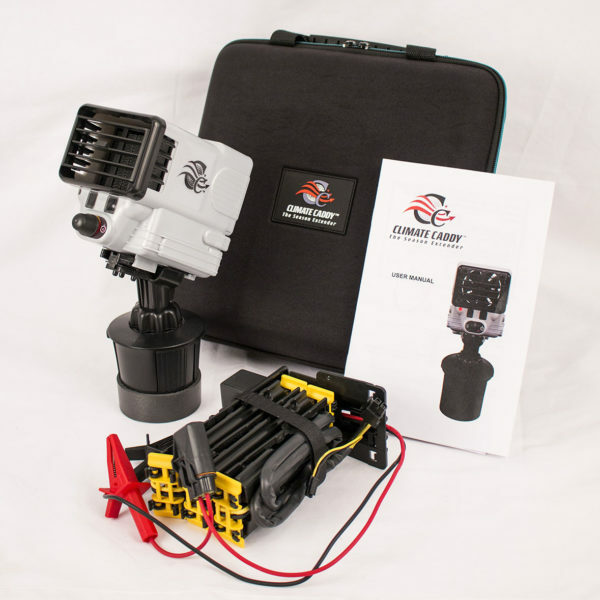 Provides 2 USB ports for charging phones, range finders, and other devices. Customers who bought fans were also interested in Coolers and Cooler Trays and Under Seat Stprage Trays. Let our friendly customer service staff answer your questions about our golf cart fans. We offer the portable golf cart fan or the sturdy dual fan and heater. Please click on any of the golf cart accessories to the left to get full technical descriptions, prices, and ordering information. Make your golf cart look the best in town with golf cart accessories from Frugal Dougal’s Golf Cart Accessories!